iPad Air Instead Of PC? 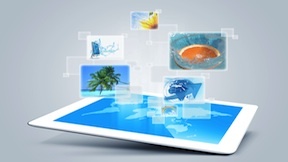 Consumers are increasingly turning to tablets to handle more of their computing needs. PCMag writer Tim Bajarin, in a recent story on the magazine’s Web site, suggests that with the release of the iPad Air, the transformation of tablets into mini-PCs is just about complete. Bajarin has plenty of praise for the Air. Not only is the iPad the thinnest and lightest full-size tablet on the market, it is one of the most powerful. That’s because Apple has added a 64-bit A7 processor. As Bajarin writes, this processor is already powering most mainstream PCs and laptops. This is the first time, though, that it’s inside a tablet. Because of this, Bajarin writes, the iPad Air might be the perfect PC for most consumers. The more powerful processor brings better apps to the iPad Air, Bajarin writes. It also allows for more multi-tasking. This is why he says that the iPad Air is an ideal personal computer for most consumers while at home. This isn’t to say that the iPad Air can replace PCs and laptops, Bajarin writes. It’s easy and convenient to have fun on an iPad Air. You can use it to browse the Internet, send Tweets, watch movies and read the news. But it’s still not easy to do real work on the iPad Air. You don’t, for instance, want to write a 20-page business report on the device. Still, the impressive iPad Air is one more step closer to a real PC experience that fits in the palm of your hand.